Legislature • House bill's sponsor says measure is aimed at pedestrian safety. 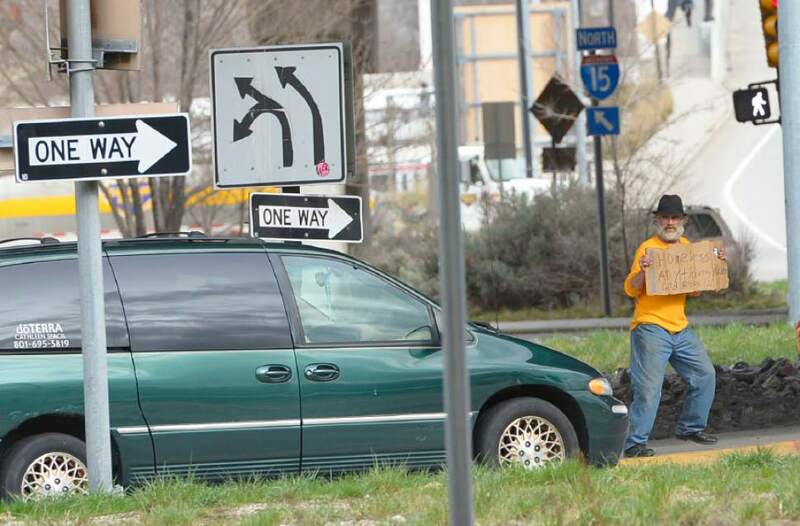 Leah Hogsten | Tribune file photo Lee McCashland panhandles along 400 South in this 2014 photo. A bill aimed at prohibiting panhandling on high-speed highways is framed as a pedestrian and traffic safety measure. While he was in Florida over the summer, Rep. Steve Eliason said Tuesday, he saw pedestrians walking up and down freeway ramps, around and in between cars, asking for money. The Sandy Republican said it could be an omen of things to come in Utah after the state&apos;s anti-panhandling law was ruled unconstitutional in 2012. "Vehicles and people are just not a good combination," he said. Eliason received committee approval for a bill, HB161, that would criminalize panhandling on freeway on- and off-ramps. Rather than directly targeting panhandling, ruled a form of protected speech by U.S. District Court Judge Ted Stewart, Eliason&apos;s bill prohibits a pedestrian and driver from exchanging money or property on freeways, highways and paved roads with a speed limit over 35 piles per hour. The bill excludes activity related to traffic crashes and medical emergencies, like the exchange of insurance information, or when a driver is legally parked. "This applies only to, shall we say, high-speed roads," Eliason said. "This does not apply to the majority of road miles in the state." Past laws have restricted panhandling on sidewalks or along all roadways, and have resulted in court challenges on the basis of First Amendment protections. Eliason said he wrote his bill to avoid the issues of previous laws, while addressing the safety risks that result from blocking or impeding the flow of traffic. "It can apply to both the pedestrian and the driver," Eliason said, "because they&apos;re both engaging in behavior that is risky to both parties, as well as other motorists." No one spoke against the bill during Tuesday&apos;s committee hearing, but some organizations have previously stated that Eliason&apos;s proposal would prohibit roadside collections for charitable efforts, like the "Fill the Boot" campaign organized by the Professional Firefighters of Utah Union. Union president Jack Tidrow said "Fill The Boot" would be affected by bill, but that collections could be moved off the road and into other public spaces. "There are still ways to collect money," Tidrow said. Rep. Mike Winder, R-West Valley City, said that as the former mayor of West Valley, he supports the bill as a tool to help local governments maintain public safety. "People need to know that in the state of Utah we do value safety on our roadways," Winder said. Marina Lowe, legislative and policy counsel for the American Civil Liberties Union of Utah, said the ACLU is always concerned about bills that impact panhandling, but does not have specific objections to Eliason&apos;s proposal. "We do appreciate that [Eliason] is focused on the safety of pedestrians," Lowe said, "rather than trying to limit constitutionally-protected speech." Under the bill, a violation would carry the penalty of an infraction, similar to jaywalking, Eliason said. Three or more violations in a single year would increase the penalty to a Class C misdemeanor. "If somebody is continually putting themselves at risk, then we step it up a little bit," Eliason said. The House Law Enforcement and Criminal Justice Committee voted unanimously to support the bill on Tuesday. It will now go before the full House for consideration.